Anyone who has seen the 1968 film, The Lion in Winter, is likely to react to the news of a remake with a single word: "Why?" Watching the Showtime movie directed by Andrei Konchalovsky and starring Patrick Stewart and Glenn Close does not provide a satisfactory answer to the question. It’s not that the new version of The Lion in Winter is a bad movie. James Goldman’s screenplay, adapted from his play, is fine. Patrick Stewart as Henry II is fine. 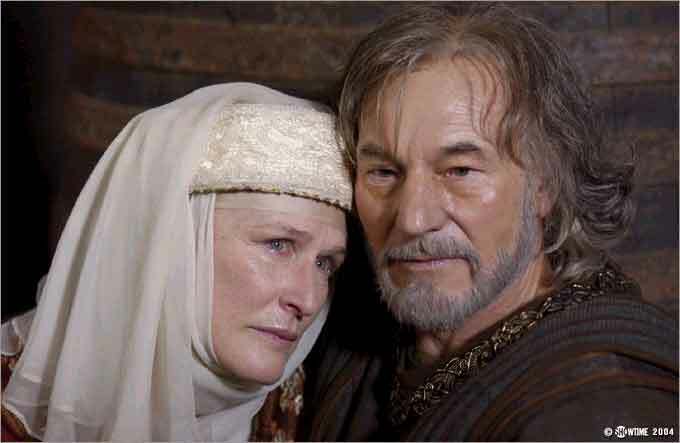 Glenn Close as Eleanor of Aquitaine is fine. Everyone in the movie is fine, as is the soundtrack and the direction. The problem is that the 1968 film had, in addition to Goldman’s screenplay, Peter O’Toole and Katherine Hepburn as Henry and Eleanor, a rousing, unforgettable score by John Barry, and the introduction of two ultimately enduring talents — Anthony Hopkins as Richard the Lionhearted and Timothy Dalton as King Phillip of France. Any remake of this outstanding film needs to at least provide a fresh perspective, a moment when someone who’s seen the original can say, "Well, this puts a whole new slant on the story." And a very interesting story it is. The year is 1183, it is Christmas, a time for the royal family to gather. Mother, Eleanor of Aquitaine, has been let out of her prison for the occasion and Father, the aging Henry II, founder of the Plantagenet line of English kings, is reluctantly pondering his succession. The candidates are Richard, Eleanor’s darling, courageous and militarily adept, but also a violent hothead, and John, unattractive, immature, maladroit and, perhaps for those very reasons, his competitive father’s favorite. And then there’s Geoffrey who, with his cold-blooded competence, is probably the most viable candidate for the throne, but who is rejected by both his parents. All in all, standard fare for a daytime soap opera except that much of it — and not just the conflict around succession and territory — is based on historical fact. Goldman’s screenplay so lucidly explains this tangle of family intrigue that most viewers quickly forget they are watching a story about nine hundred year old political issues. After all, the question of how grown children cope with powerful and charismatic parents is timeless. Unfortunately there is nothing in this new version that makes it a worthwhile alternative to the 1968 film. One serious problem is the casting of the two leads. While Stewart and Close are both wonderful actors, Stewart appears to be older than Close, so the reversed difference in age between Eleanor and Henry (she was eleven years older than her husband) is not evident. As a result, the pivotal scene where Eleanor ridicules Henry about his advancing years and the unlikelihood of fathering another heir does not have the strong whiff of revenge that it should, the mockery of an elderly woman watching her younger husband face the narrowed options of old age. Much of their interaction, in fact, is robbed of power and they come across, not as the fascinating lovers of history, the handsome, brilliant boy who’d married a sophisticated older woman, but just another aging couple fighting over the kids and the estate. As for the rest of the cast, Rafe Spall as John, Andrew Howard as Richard, and John Light as Geoffrey, while there’s not much to complain about there’s not much to cheer about either. They’re all fine. Nothing more. A good dinner theater production of the play would probably offer as much.